Way back in 2014, we posted the teaser for an upcoming documentary about the legendary angler and writer Joe Brooks, featuring parts of his story that have never been told. Finally, here’s a full trailer for the film, which will be out next year. Brooks’s protégé, Lefty Kreh, kicks things off with an assessment of the man that may surprise you and that will make you want to learn more. Two of Brooks’s great-nephews have pulled together the fascinating story of a troubled man who was saved by the love of a good woman and a passion for the outdoors. I can’t wait to see the finished product, which looks enthralling and deeper than most films about the sport. Joe Brooks (right) and the legendary Florida guide Jimmie Albright. Huge Congratulations Michael! …Can’t wait to see this (although I know the story – and benefitted from his tutelage …albeit posthumously…). 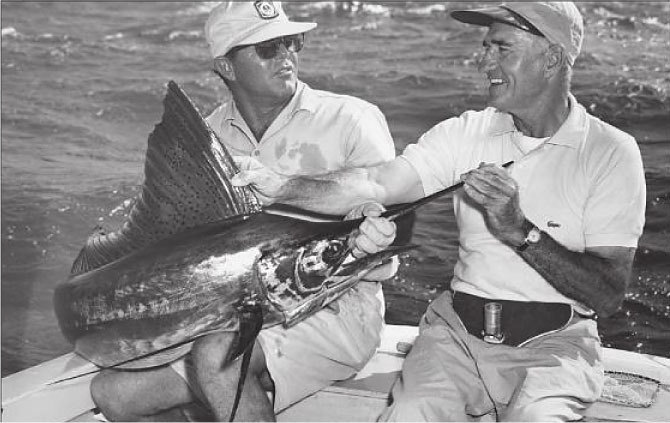 I really can’t wait for the rest who don’t know, to find out what an incredible angler he was, and how much thanks we as modern Saltwater fly fishermen owe to him for his efforts! He talked about the past, and we talked about the Grand Ronde River.. and the Bahamas too. I heard about the friendship he had with Joe Brooks, and the love Lefty had for him.. I’m now retired in FL and thinking about these special people..